Two-Year Certificate Program is a Great Value! 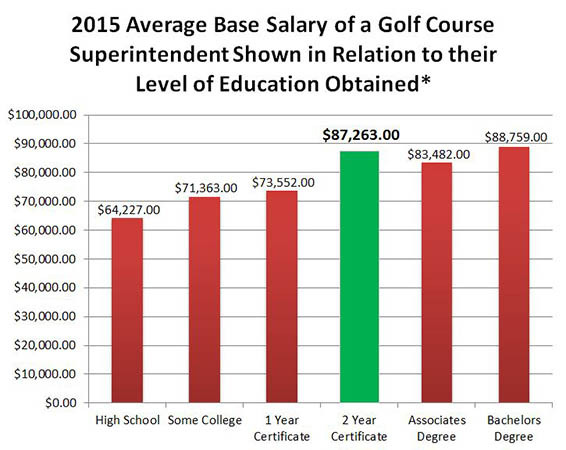 According to the 2015 Compensation and Benefits report by the Golf Course Superintendents Association of America (GCSAA), Golf Course Superintendents with a 2-Year Certificate are among the top earners nationwide. *Data includes both class A and certified superintendents. Overall, the average base salary for a Superintendent in America is $85,204. Read this interview with Ned Lipman discussing turf management salaries.